Cheeziness aside, Nic n I attended an event organised by Joe Morin – Blogger’s Night Out on Monday night at the Wynn. As always, it was brilliantly organised, with a reception in Joe’s suite complete with private bar and waiter, great conversation with other seo’s and goodie bags prior to the show. Even those of us that are not born and bred in the UK picked up on the subtle British Monty Python humor. My favorite part was of course the men in tights cheerleaders? I’ll let Nic speak for herself by my guess is that a highlight for her was the alcohol allowance. Yep, you’re allowed! All in all, a great night, planned around a great show. 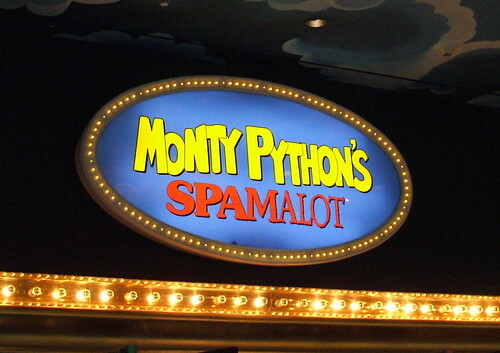 We highly recommend Spamalot! Special thanks again to Joe! YEAS I made the blog already, sweet!